The color white signifies orderliness and purity, but it also expresses liberty and freedom making it a suitable color in different types of homes. The color white can also help make home interiors look bigger and feel more fresh, peaceful and airy, while offering plenty of decorating options. However, some people find it hard to decorate a home with white walls, even if they want the color white to stand out or be the focal color of their interior. If you are one of those who are passionate about the color white, but do not know how to apply it in your home, then this will surely be helpful to you. Why Should You Choose The Color White? White is a very simple color and you will not go wrong with it, especially when you do not know how to work other colors in to your home. If you are looking for a neutral but bright color to act as a backdrop to a room, then white is your best option. In fact using white throughout an entire room can make a very dramatic statement in your home if you really want a unique and modern interior design. Aside from the pleasing appearance of white in interior designs, the color white can also encourage the feelings of cleanliness, airiness, spirituality, clarity and spaciousness. 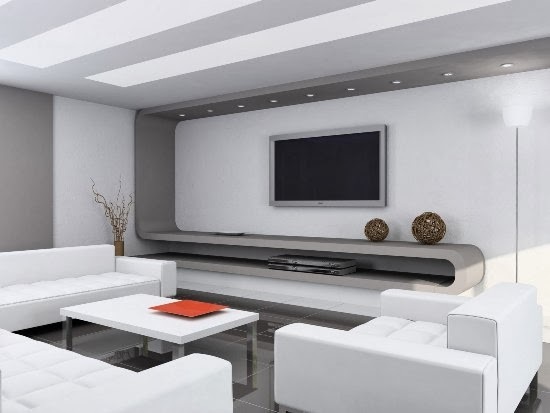 Though white is Ipleasing to the eye and offers exquisite interior style, it can be quite difficult to maintain. If you have pets and children, or if you live in wet areas, the color white may not be meant for your home, as you will have to deal with stains, dirt and spills. As a matter of fact, some people find that white interiors are overbearing on the eyes and make a room appear to be sparse or cold due to lack of warmth from colors. How Do You Apply White To Your Interior? In order to use the color white successfully in your interior design, you need to incorporate other colors as well. You can achieve the best white interior design you need by using your preferred style of fabrics, furniture, accessories and flooring. You have the freedom to use antique painted furniture and fabrics if you want a sophisticated and elegant look, but you can also opt for an easy doing look by utilizing light furniture and voile fabrics. Moreover, you can also aim for a modern minimalist interior or a rugged chic style. Do not think that there is only one shade of white available, because there is more than one shade of white and you can find them on any paint chart. Light and clean effects can be achieved using bright white, while muted white or cream shades can help reduce the optimum brightness of white shades. However, you should also consider mixing in other colors with the help of accessories or an accent wall to warm up the whiteness. As a matter of fact "A white space isn't necessarily made up of all white things! A cold, sterile space turns into a warm inviting serenity." says http://susan-hopkins.com/ . The best interior design for a white themed home is the incorporating of natural materials used in furniture, window treatments, flooring and accessories. You can opt for wood or bamboo to warm up you interior and use your creativity to determine where and how to place them. To reduce the brightness of white, you can also consider looking for rugs, curtains, furnishings and throw pillows that have patterns. However, if you prefer a complete white interior, you can opt for pain white textured patterns or white with pale materials. Always remember that texture is considered essential for white interior designs in order to add interest, appeal and substance to a plain white interior. Be creative and aim for smooth and glossy surfaces, including soft and furry textures.